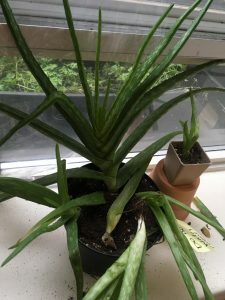 I have an aloe that was beautifully healthy, spawned three pups, also very healthy, and then a fourth a while later (around the time the first three hit 10-15cm, when I was going to repor them, but didn’t because of the new one). In the last month or so, they’ve all started to do quite poorly. First the littlest one came out. It’s root about a cm long. I tried to repot it, but it’s not thriving. Then the mama plant started wilting. It always had a few leaves that had a dent in it, but then many started to appear, and the thicker healthy leaves started to thin. The new growth was coming in lighter green, but I thought that was from less light as the season changed. The adolescent ones are really not doing well. They’re losing leaves and also denting and flopping over. Previously they had a beautiful full shape and healthy leaves. Two things I’ve done differently (beside the winter diminishing sun), I added more soil to the pot when I reported the littlest one. I was hoping it would help sturdy the big plant. And I’ve been watering less (was on a 3-4 week cycle, less now). Part less watering because the deeper part of soil wasn’t drying out entirely, part because I’ve had fungus gnats and have been drying out everything. Just now one of the adolescent pups cane out of the soil (when I had my finger in to test moisture). It’s roots look shallow and deflated. I was surprised. I’ll try to capture all this in the one photo. Any and all advice appreciated! Thank you. I am so sorry that your Aloe vera is not doing well. Aloe vera is a hardy succulent native to Africa that’s easy to grow. It thrives in poor soil and requires very little water. The gel that comes from its thick leaves is often used to cool minor burns and sunburns. Plants grown indoors will rarely bloom. They require bright filtered sunlight and like it hot (65-85 degrees), dry, and sunny. Aloe Vera plants do not do well in temperatures below 40 degrees..
Aloe is drought tolerant; only water your plant when the top inch of soil is dry to the touch. When you do water, water it well, but never let your plant sit in water. Aloe can be grown in any well-drained quality potting media and should be repotted as needed to refresh the media or to give the plant room to grow. The size of your aloe plant will depend on the amount of room you provide for root growth. To keep your aloe plant small, keep it in a smaller pot; to promote growth, move your aloe to a larger pot to give it room to grow. Be sure to not increase the new pot by more than two pot sizes; too large a container can hold too much moisture that could lead to root rot. There are very few pests that bother Aloes and diseases are rarely a problem. The following link will provide you with more specific information on caring for an Aloe vera.